Given the requirement for information on four prices, OHLC, in order to construct a candle, the resulting candle shapes can take on a variety of forms. The body may be very long or very short, and similarly for shadows. However, either the body or the shadows may sometimes not appear at all. This multitude of combinations allows a grouping the candles based on their appearance, enabling them to be interpreted. All the individual candles are called basic candles. Most of them are not patterns as such, but they can often play an important role in the assessment of the current situation of the market and its possible further development. Basic candles are components of more complex patterns which can contain one, two, three or even more basic candles. It can be seen that Japanese basic candles and associated patterns can have colorful and imaginative descriptive names. Every single candlestick on the chart is classified as one and only one particular basic candle. We can look at basic candles as building blocks, from which patterns are composed. Having the accurate way of defining basic candles helps to define patterns being precise and avoiding ambiguity. Basic candles are not patterns per se. The notion of the short and long line is crucial when assessing any basic candle. Please see Long and short lines for more details. 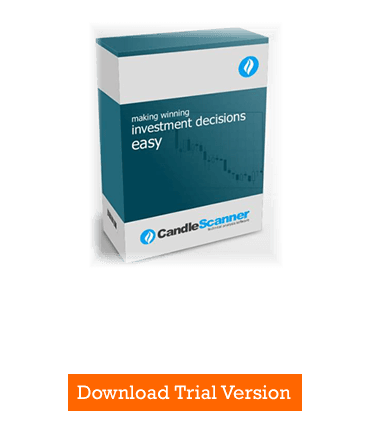 Please visit this article to learn more about the Candlestick charts: CandleScanner Color Theme. Candles, that is candles that have two shadows shorter than the body. Marubozu candles, that is candles that do not have at least one shadow; additionally the shadow, if present, cannot be longer than the body. Spinning top candles, that is candles with different opening and closing prices and having at least one shadow, where at least one shadow has to be longer than the body. Doji candles, that is candles that do not have a body; in other words the open price is equal to the close price. This group of basic candles is just called candles. High Wave – a kind of Spinning Top occurring on a long line (if one of the shadows is at least three times longer than the body). In CandleScanner spinning tops are marked by default in dark blue color. Note that CandleScanner can also classify a candle as a doji when the opening and closing prices differ by a very small amount (in theory, a doji should not have a body, but the difference may be negligible and then on the chart is hardly visible). For more on this please see the following articles: The problem with doji candles (Part 1) and The problem with doji candles (Part 2). Doji may occur with or without shadows. In CandleScanner the doji candles are marked in red color by default when using the CandleScanner color theme. All of these basic candles can be part of candlestick patterns, and therefore, it is important to know if we are dealing with a doji candle or a spinning top. It is easy to mix them up when a spinning top has a very small body, which looks on the chart as if the open and close prices are equal.